An Afghan woman casts her vote during parliamentary elections at a polling station in Kabul, Afghanistan, Oct. 20, 2018. Fifteen people were killed and another 60 wounded Saturday when a suicide bomber tried to enter a polling station in northern Kabul. Saturday’s parliamentary elections in Afghanistan were reportedly marred by sporadic attacks throughout the day, along with reports of long lines and millions of people casting ballots. “We are not afraid of threats because we want to build our country. Today we had a lot of threats, but we are still here to vote,” said Fariba, a female voter in Kabul. The U.N. Assistance Mission in Afghanistan (UNAMA) said Saturday night that it was encouraged by the large turnout by Afghans to exercise their constitutional right to vote for representatives of their choosing. It also emphasized steps being taken in light of the violence. "The mission notes the immediate steps taken by the Afghan electoral authorities to ensure that no eligible voter is denied the right to vote due to technical failures: Many polling stations will have extended hours tonight and those that did not open today will be opened tomorrow. The mission also notes that arrangements are being put in place to enable citizens of Kandahar to vote next Saturday, after the polling was postponed due to recent security incidents." Voting was carried out in 32 of Afghanistan’s 34 provinces. In Kandahar, voting was postponed for a week after Thursday’s killing of influential commander General Abdul Raziq that was claimed by Taliban. Elections in Ghazni were postponed until next year due to political disputes among the local population. 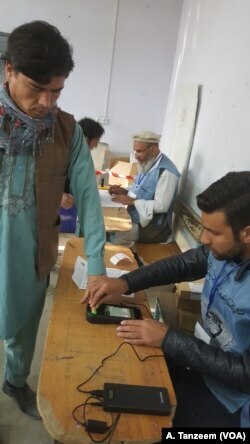 Voting, scheduled to start at 7 a.m. local time, was delayed in several stations due to either the election staff not arriving on time, or technical difficulties with the biometrics system newly introduced in Afghanistan in an effort to reduce fraud. The Independent Election Commission of Afghanistan announced that it would compensate by keeping those sites open until 8 p.m. rather than the scheduled closing time of 4 p.m. 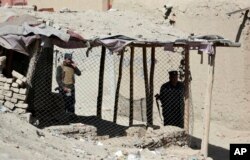 The Election Complaint Commission of Afghanistan expressed concerns over what it called “irregularities” in the process. In several other districts across the country, reports emerged of either shootings, shelling, or small explosions without reports of casualties. News was hard to get from Baghdis where cellphone service was not working.